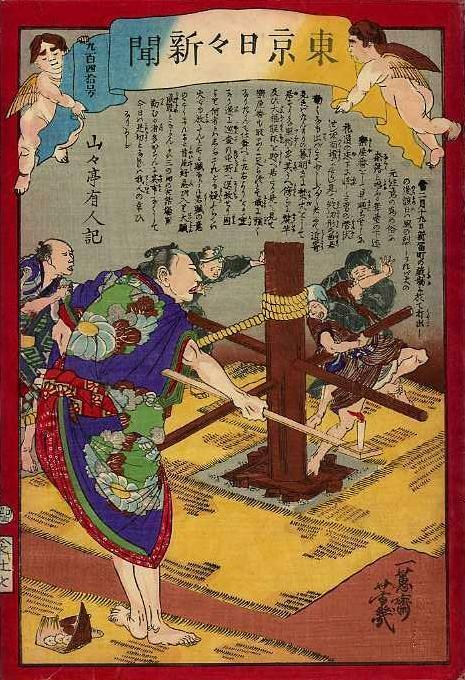 On the 19th day of this 2nd month in a theater in Shintomicho, after the beating of the drum [at the end], as a [source of] fire precation, for that day the wind was strong, a dressing-room attendant was made to look around as far as the underside of the stage commonly called hell, and [he] glimpsed in a facelamp the hiding of a suspicuous man under the floor of the flowerway. . . . [He appeared to have made a fire at the opening curtain] and by [him] was a cache of baked potatos and bean jam rice cakes. . . . The suspicious man is apprehended by stagehands as the dressing room attendant illuminates hell (see below) with a facelamp (see below). At the attendant's feet are the man's baked potatoes and toasted bean jam rice cakes (see below). theater reflects 劇場, which would be read "gekijō" in Sino-Japanese, but here is glossed しばゐ (shibawi, shibai), a Japanese expression that is usually graphed 芝居. 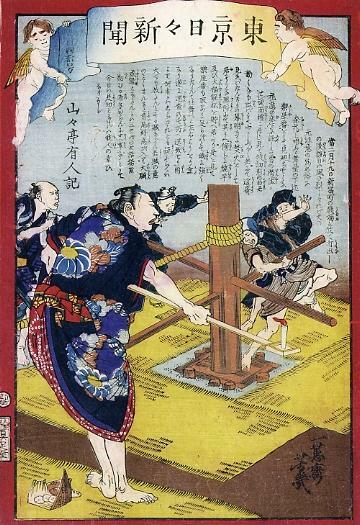 This is typical of glosses that use Japanese to illuminate the meanings of Sino-Japanese terms in the written text, while showing how the text in meant to be read as an oral narrative. Shintomicho (新富町 Shintomichō) is now part of Chuo ward of Tokyo. In 1872, Moritaza (守田座), one of Edo/Tokyo's major kabuki theaters, moved from Saruwakamachi (猿若町) to Shintomicho, then part of Kyobashi ward, and was renamed Shintomiza (新富座) in 1875, the year this nishikie was published. Destroyed in the Sukiyabashi fire of 1876, the Shintomiza was rebuilt in 1878 with all the latest features, after which it became and remained Tokyo's number-one stage for kabuki performances until the construction of Kabukiza (歌舞伎座) in 1889. A sign in Shintomi 2-6-1 in Chuo ward marks the site where the theater existed until it was destroyed in the Great Kanto Earthquake of 1923.
hell reflects 奈落 (naraka), a Chinese transliteration of the Sanskrit word "naraka", which appears to mean of, or pertaining to, humans. The term refers to the underworld where transitory souls are punished (hell) or purified (purgatory). The "hell" of a theater was the space under under the walkway, catwalk, or flowerway (花道 hanamichi) and below the main stage (舞台 butai). In this space were revolving stages (回り舞台 mawaributai), moved by mechanisms like those shown on the print, and traps, platforms, or elevators (迫 seri), on which a performer or an entire set could be raised or lowered to and from the stage. facelamp reflects 面燈 (tsuraakari), a candle mounted on a pole to illuminate an actor's face. baked potatoes (焼芋 yakiimo) are toasted, roasted, or baked over open flames or by imersion in coals or hot stones. bean jam rice cakes (大福餅 daifuku mochi) are made by stuffing a thick paste of boiled and sweetened red soybeans (餡 an, 餡こ anko) in a thin wrap of pounded white rice (餅 mochi). Also called just "daifuku" (大福), which means "great luck", such cakes are commonly given and eaten to celebrate auspicious occasions or otherwise bring good luck. Daifuku are sold at wagashiya (Japanese-style confectionery shops), convenience stores, and concession stands at shrines and temples. Kabuki theater lobby vendors sell them to eat in the theater or at home, or to give to people as "I was there" souvenirs. While daifuku can be eaten cold, they are commonly toasted, if not microwaved (carefully).